Her prize winning book of poems, What Brings You To Del Amo, was published in October 2007 by University Press of New England. Her first book of poems,Embellishments, was published in Febuary 2003 by Chatoyant. Her poems have appeared in a number of literary publications including "Paris Review", "Ploughshares", "Antioch Review", "Boulevard", "Quarterly West", "Western Humanities Review", "Witness" and many other publications. Poems appear in recent anthologies "Are You Experienced?" (U of Iowa) and "Dorothy Parker's Elbow: Poets on Tattoos, Tattoos on Poets" (Warner), "Sweeping Beauty: Contemporary Women Poets on Housework" (U of Iowa), "Manthology: Poems From the Male Perspective" (U of Iowa). 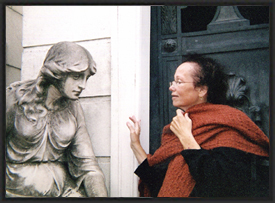 She has been a fellow at the Ragdale Foundation many times and once at Vermont Studio Center. She has received many grants for her teaching and writing from "Poets and Writers," Tempe Cultural Council, Arizona Humanities Council, Arizona Commission on the Arts, and the Scottsdale Cultural Council along with several Professional Development Grants. She's completed poetry manuscripts, "Reading Electra To Sleep" and "Madame X." Virginia is currently working on a memoir called "Famished" and a poetry collection titled "Introducing the Varga Girl."